One of the very interesting aspects of learning about tensegrity is how multidimensional the process becomes. Kenneth Snelson coined the phrase, floating tension to describe his early sculptures when he first started playing with tension compression models in 1948. Little did Snelson realize that his shape tension compression discovery would lead to such a diversity of architectural and relevant descriptions about shape sensing performing within Nature. In recognition to his fundamental discovery I introduce the term, tensio natat, floating tension. It’s way more than just about shape, it’s how nature uses shape as a way to solve problems, like a small arthropod caterpillar crawling , employing the principals of tension integrity, crawling over the surface of a leaf. How can such a soft creature with no hard skeleton move with such liquid smoothness, what is the nervous system that controls such slinky motion? As an observer of Nature if you really want to demonstrate something as simple as a caterpillar crawling then try building a robot that accomplishes just such a locomotion, just try. If you were a NASA supervisor describing a remote terrain vehicle your description profile would be very close to what a caterpillar accomplishes. The imaginary engineering mandate for prospective robot builders would highlight, the potential of the robot to perform …”astonishingly efficient gait and capable of maneuvering mobility over obstacle strewn, rough terrain.” Such a robot has been built in Israel I will be describing from the Bioinspiration & Biomimetics. 7 (2012) 04006 (9pp) authored by O Orki, A Ayali, O Shai and U Ben-Hanan in Modeling of caterpillar crawl using novel tensegrity structures. Engineers are constantly fascinated with how insects move, first with multi legged motion and now with the slithering efficiency of caterpillars. From their engineering perspective the real study of caterpillars centers around the generation and control of locomotion within the body of the caterpillar which are soft bodies without any support from a hard skeleton. In order to overcome this pivoting hurdle the caterpillar uses inner fluid and tissue pressure to stiffen the body, permitting muscles to perform work. ” As a result, the contraction of any one muscle affects all the rest, either by altering their length or their tension, which presents major challenges to the control system,” according to the authors. As a caterpillar crawls, viewed from the side a wave of muscular contractions starts at the back end to progress forward to the front. “Anatomically, crawling is achieved by muscles (contracting which are attached to invaginations on the inside surface of a soft and flexible body wall, ” pulling each side tergal segment drawing closer to its nearest neigbour’s tergal segment, then onto the next pair of tergal segments. The simple nervous system controls, “The basic timing and patterning of the rythmic motor pattern is assumed to be generated and controlled by a central pattern generating network (CPG net). Other engineering attempts were previously made using rigid joint elements employing linear actuators by Wang and Stulce. Trimmer developed a deformable caterpillar model but introduced ,’…. considerable control complexities.Yet each of these investigators were not matching Nature’s relatively simpler caterpillars control system and maneuverability. So far in the cerebrovortex.com essays mostly shape has been discussed within a static concept but remember the most intriguing thing about Nature, everything is moving. The authors took a similar tact to employ tensegrity as the basis for the robotic motion for controlling a caterpillars segmenting wave shifts slinking along its soft body. ” Movement is achieved by changing the lengths of some of the tensegrity elements, which in tern causes the shape of the robot to be altered. One of the major challenges in the design of such robots is the maintenance of pre-stress forces during motion, which is necessary to preserve structural stability.” Some other robot investigators have tried to resolve this by building actuators to always increase the pre-stress forces only on the cables thereby guaranteeing the robots stability but constraining the robots shape change. Other investigators used minor shape changes which were not far removed from the stability balance point of the structure but sacrificing equilibrium at the same time of the structure if too much motion was present. The authors opted to mimic Nature to produce their system to have well constrained data, not over constrained and redundant or under constrained and inadequate. Just such a system is potentially possible if only force equilibrium is achieved around each tensegrity joint, ‘to create a well-constrained system termed a statically determinate structure. ‘ The authors chose to work around a novel statically determinate tensegrity structure, by addressing a special type of determinate structure called an Assur structure which exhibits a specific property of shape, in which, a special configuration, termed a singularity in which pre-stress is present in all the elements and if the three component legs meet at a single point. Assur structures exhibit specific properties, …”with the removal of any rod results in a mechanism composed of all the other rods (those remaining rods involved with the segments).” The triad truss triangle accomplishes this by not leaving out any rods which might be isolated as immobile, outside of the tension net sustained within all the remaining rods, 5 in this case out of 6. In other words, changing the length of any rod will result in motion of all remaining rods. In 2010 it was proved that every Assur structure can assume a special configuration (called a singularity) in which pre-stress is present in all elements. Singularity is obtained when the continuation of the three ground legs intersect at a single point as in figures (b) and (c). 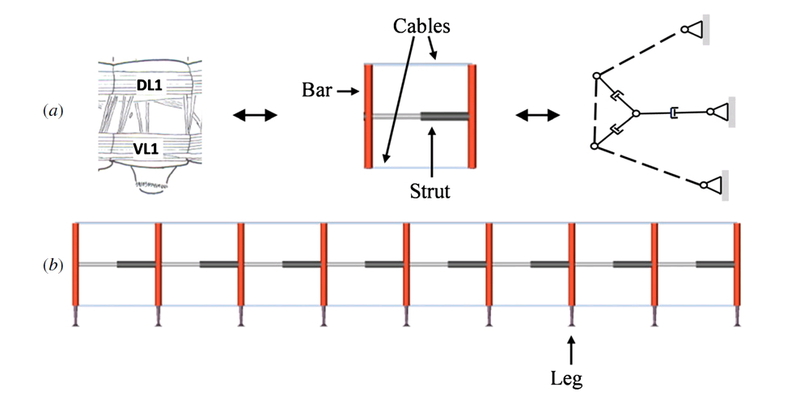 Figure (c) is comprised of the tensioned rods, replaced with cables, marked with dashed lines and compressed rods are replaced with struts., compared to (b) which is only composed of all rods. This singular triad configuration structure (c) can sustain pre-stress forces (everywhere, simultaneously in all components, thus both local and distant pre-stress are in harmony) and is termed a Assur tensegrity structure. The real caterpillar has hundreds of muscles to control within its abdominal linked body segments, each segment involves approximately 70 discrete muscles. ” The major abdominal muscles in each segment are the ventral longitudinal muscle (VL1) and the dorsal longitudinal muscle (DL1). Each segment has its own distinct VL1 and DL1 muscle and each is controlled separately. The VL1 and DL1 attach at the inner stiff ridges on the upper and lower surface of each segment termed tergal and sternal antecosta respectively. The caterpillar model robot was modified to fuse the triad into a single rigid un-actuated bar and cables attached at each side to a merged 3 ground supports like a T on its side rotated 90 degrees, with legs connected at the bottom of each T bar. “Low-level control is inspired by the mechanical characteristics of the caterpillar. It is composed of localized controllers for each of the strut, cable and leg elements. Perhaps a reader of this essay is now asking why so much detail of the control sequence can’t it be summarized more briefly? Here’s my point. These authors have singled out in their solutions the critical division of pacing with sensing during the locomotion sequence. It’s precisely this sort of thing that Nature did a long time ago to derive the details of moving a tensegrity creature. Through robots mimicking a caterpillar moving we learn the hierarchical command structure that separates local control from central control on a shape changing machine. I find their solutions fascinating that these authors keep referring to the caterpillars arsenal of control pacing network for inspiration to solve moving the robot. “Cables simulate the function of caterpillar muscles. Biological caterpillar muscles have a large, nonlinear, deformation range and display viscoelastic behavior. If all controller parameters (F0, k, l0 and b) remain constant, the model will remain in steady state and will not move. Cable behavior is controlled by input signals from highlevel control to cable controllers (which we call a high-level command). and shrunken. This phase ends when the most posterior leg is lowered and touches the ground. In the second phase, the crawling wave passes through the body. In the third and final phase, the three anterior segments are lifted and expanded one after the other. The simulation is programmed such that the next stride begins before the previous one is completed. The authors summarized their control findings with, “We found that impedance control keeps the Assur tensegrity structure in a singular configuration, thus maintaining the stability of the structure. In addition, impedance control enables us to produce a soft model with a controllable degree of softness. While impedance control is complex in typical industrial robotics, it is much simpler to implement in tensegrity structures. For reasons outlined below, impedance control is a ‘natural’ choice for our model. 1. In tensegrity structures, each element is controlled separately and independently. This is in contrast to a standard industrial robot in which all DOFs are conjugated. 2. There is no need to transform end-point forces to actuator forces, and there is no need to consider robot dynamics in the impedance control law; the equation is used as is. 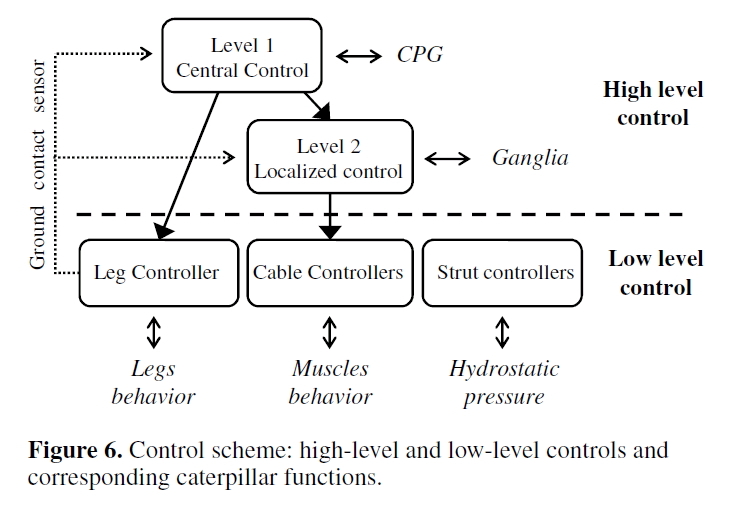 “The model exhibits several characteristics which are analogous to those of the biological caterpillar, empirical testing of the model has demonstrated that effective crawling requires that each stride be executed in three different phases. Trimmer et al examined the kinematics of the biological caterpillar and found kinematic differences between three anatomic parts of the caterpillar: the thoracic segments, the midbody segments and the posterior segments. This distinction is similar to the three stride phases of the caterpillar model. The caterpillar model can navigate different terrains and in different directions using the same crawling pattern without adjusting the control scheme. This is made possible by slow stride speed and firm ground planting. The same is true for the biological caterpillar. The internal pressure of the biological caterpillar is not a function of its size. During growth, its body mass is increased 10 000-fold, while internal pressure remains constant. In the same way, our model is able to use the same pre-stress forces regardless of the model size (although the pre-stress forces must excide a certain force threshold). “In our model, only three segments are contracted.The reason for this limitation is that, when four segments (like a real caterpillar) are contracted and lifted together, the impact of gravity becomes much larger (especially in phases 1 and 3). This makes it difficult to program locomotion in a way that will be robust in all crawling directions (vertical and upside-down). This discrepancy should be improved in future versions of the model. In summary, our model is consistent with many of the actual biomechanical attributes of the Manduca sexta caterpillar. Our research further suggests a few characteristics that the biological caterpillar may possess. In the model, stride timing is strongly dependent on the signals that the legs send when touching the ground. Without those signals, locomotion is not robust—it tends to be inefficient and many times unstable. Observations show that feedback from the legs is not essential for maintaining locomotion gait in fast insects like the cockroach, while it is critical in slow insects like the phasmid (the stick insect). In other words the robot caterpillar needs either a primitive proprioceptive mimicking system to provide leg feedback plus a primitive vestibular system could also be built in, to also stabilize the position of the entire body while the caterpillar robot segments slink across a surface. The basis of their design is centered on a Assur tensegrity structure that is in pre-stress balanced through out the entire structure all segments attached yet locally and independently controlled in their execution of the locomotion sequence at the same time central pattern generators as Level 1 Central Control are initiating before each phase segment motion is completed. 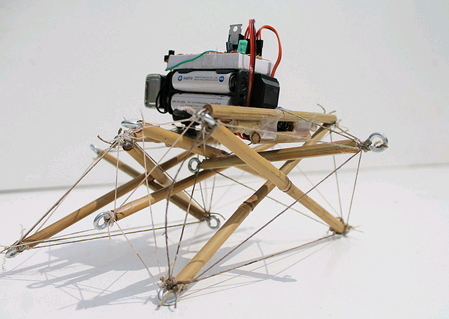 The robot caterpillar works is based on a very mechanical sensing of tensegrity elements. Small control systems mimic simple nervous systems based on tensegrity incorporation into the designs employ shape sensing as changed pre-stress elasticity. So what does this teach us about concussions? Our brains are massive tensegrity structures built on eons of empirical designed tensegrity singularities controlled both locally and centrally within pre-stressed networks that sense shape changes at the protein dimension within brain networks and execute the output at the macro level like vision and vestibular/otolith reflexes that go off because the concussion has perturbed the tensegrity Level 1 control network, see the connections that robot caterpillar Assur tensegrity control networks teach us? As a final description let me quote from Dimitrije Stamenovic and Donald Inber’s Tensegrity-guided self assembly: from molecules to living cells from Soft Matter, 2009, 5, 1137-1145. Here is a particularly pertinent observation from their paper. “Because molecular assembly events are influenced by force and mechanical loads are distributed in speciﬁc patterns across cytoskeletal elements, biochemical reactions can be induced to proceed in speciﬁc patterns that precisely match the needs of the cell to resist those applied stresses. Due to the existence of a complementary force balance between microtubules, contractile microﬁlaments, intermediate ﬁlaments and membrane adhesion complexes, forces can be shifted back and forth between complementary load-bearing elements and thereby alter their orientation and self assembly. This simple mechanical balance has important physiological relevance for cells, tissues, and organs. One simple example is how transferring forces off microtubules and onto ECM (extra cellular matrix) adhesions decompresses microtubules and thereby promotes their assembly and nerve growth. In fact, nerves will extend new processes in whatever direction tension is applied to their surfaces through ECM adhesions, and nerve ﬁber patterns map out minimal paths that correspond to tension ﬁeld lines in whole organs, including the brain, which appear to be driven by mechanical energy minimization. Did you notice the term tension field lines in whole organs like brains? What we have is engineers designing a caterpillar robot using tensegrity parameters to accomplish shape change motion controlled to mimic Nature’s design in terms of pacing coordination. Then there is their reference to beating heart cells undergoing elastic recoil allowing the heart cells to restore their shape when they relax, which is another characteristic within a tensio natat network. Like I said engineers mimicking a caterpillar robot reveals a lot about how our brain and heart fit into a tensegrity framework. If you want to understand concussions at their basic mechanisms, first you have to understand the mechanism itself as operating within a tensegrity pre stressed framework, all elements sensing tension. The engineers are showing us how to build such mechanical robots but the real thing is so much more marvelous and mesmerizing because it builds itself.